Does your business deal with parts that require transit between manufacturing facilities for sub assembly? If so, your business can benefit from a reusable shipping crate solution. While the initial investment in a reusable shipping crate may be more than purchasing a limited or one-time-use container, the long-term savings make good financial sense for companies with a sharp eye on the bottom line and environmental responsibility. To enjoy these benefits (and many others) you can start by choosing the right reusable shipping crates for your shipping, storage and material handling needs. Fortunately, reusable shipping crates come in all shapes and sizes and you can even have them custom made based on everything from the size and shape of the product to mode of transport. 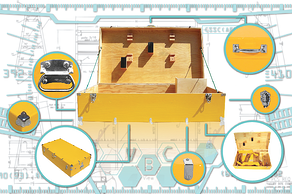 Take a look at some of the most popular types of reusable shipping crates. ...is used by manufacturers who need to store partially finished or completed parts for a period of time before final assembly, sale or display. 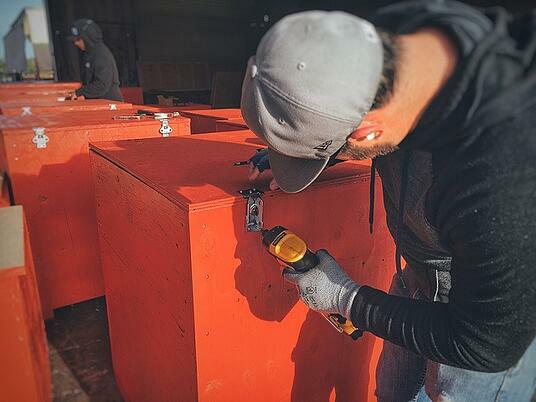 Water resistant solutions such as a slip lid, tongue and groove, water sealing paint, or linex can be used to extend the life of the crate and protect products from harsh weather conditions. ...is often used for parts requiring transit for sub assembly prior to shipping. Evaluate your production line, assembly, and shipping of your product. Do you see an opportunity to streamline your material handling, packaging and shipping procedures? Take advantage of Valley Box Company's offer for a free quote where a trained field technician will conduct a complete assessment of your product and offer reusable shipping crates solutions! ...is often used when a company has parts that require transit between separate manufacturing locations for sub assembly, or transit to customers for part returns/repairs. Upgraded fasteners and hardware can make the container easier for repeated access and even collapsible for return shipment. Protective steel weldments will prevent damage from fork lift tines and shipping wear and tear. ...consist of plastic sheets that have been heated to a pliable forming temperature, formed to a precise shape in a mold, and trimmed to create a functional product. These containers are lighter weight than their wood counterparts and can be designed with complex interior storage configurations to support and protect multiple parts in a kit-like unit. Many features can be added such as breather valves, handles, locking latches, and gasket reinforced water tight lids. ...is typically designed to protect objects such as delicate measurement instruments or calibrated tooling. Other uses include display, organization and presentation. Wooden cases can be outfitted with custom interiors fabricated from wood, plastic, fabric and foam!